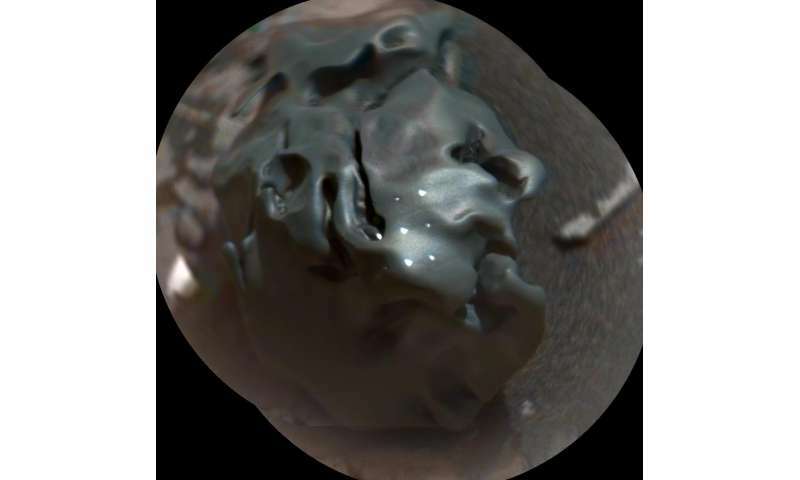 Laser-zapping of a globular, golf-ball-size object on Mars by NASA's Curiosity rover confirms that it is an iron-nickel meteorite fallen from the Red Planet's sky. 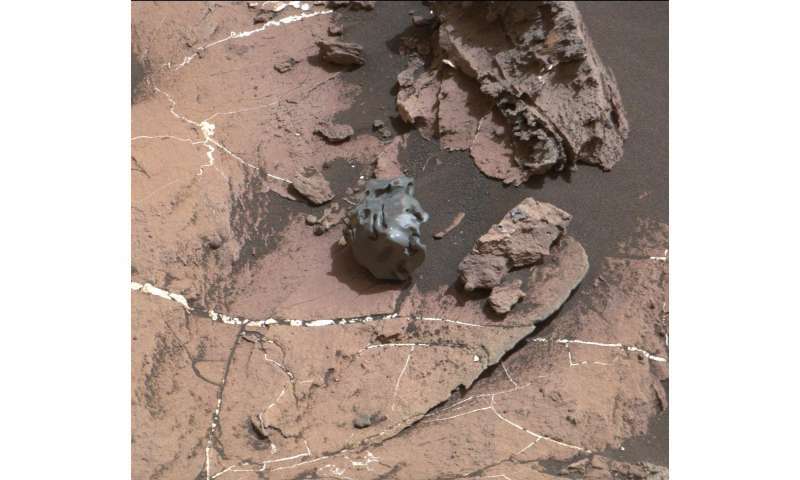 Iron-nickel meteorites are a common class of space rocks found on Earth, and previous examples have been seen on Mars, but this one, called "Egg Rock," is the first on Mars examined with a laser-firing spectrometer. To do so, the rover team used Curiosity's Chemistry and Camera (ChemCam) instrument. Scientists of the Mars Science Laboratory (MSL) project, which operates the rover, first noticed the odd-looking rock in images taken by Curiosity's Mast Camera (Mastcam) at at a site the rover reached by an Oct. 27 drive. "The dark, smooth and lustrous aspect of this target, and its sort of spherical shape attracted the attention of some MSL scientists when we received the Mastcam images at the new location," said ChemCam team member Pierre-Yves Meslin, at the Research Institute in Astrophysics and Planetology (IRAP), of France's National Center for Scientific Research (CNRS) and the University of Toulouse, France. ChemCam found iron, nickel and phosphorus, plus lesser ingredients, in concentrations still being determined through analysis of the spectrum of light produced from dozens of laser pulses at nine spots on the object. The enrichment in both nickel and phosphorus at some of the same points suggests the presence of an iron-nickel-phosphide mineral that is rare except in iron-nickel meteorites, Meslin said. Iron meteorites typically originate as core material of asteroids that melt, allowing the molten metal fraction of the asteroid's composition to sink to the center and form a core. "Iron meteorites provide records of many different asteroids that broke up, with fragments of their cores ending up on Earth and on Mars," said ChemCam team member Horton Newsom of the University of New Mexico, Albuquerque. "Mars may have sampled a different population of asteroids than Earth has." In addition, the study of iron meteorites found on Mars—including examples found previously by Mars rovers—can provide information about how long exposure to the Martian environment has affected them, in comparison with how Earth's environment affects iron meteorites. Egg Rock may have fallen to the surface of Mars many millions of years ago. Researchers will be analyzing the ChemCam data from the first few laser shots at each target point and data from subsequent shots at the same point, to compare surface versus interior chemistry. Egg Rock was found along the rover's path up a layer of lower Mount Sharp called the Murray formation, where sedimentary rocks hold records of ancient lakebed environments on Mars. The main science goal for Curiosity's second extended mission, which began last month, is to investigate how ancient environmental conditions changed over time. The mission has already determined that this region once offered conditons favorable for microbial life, if any life ever existed on Mars. Curiosity was launched five years ago this month, on Nov. 26, 2011, from Cape Canaveral Air Force Station, Florida. It landed inside Gale Crater, near the foot of Mount Sharp, in August 2012. The rover remains in good condition for continuing its investigations, after working more than twice as long as its originally planned prime mission of about 23 months, though two of its 10 science instruments have recently shown signs of potentially reduced capability. The neutron-generating component of Curiosity's Dynamic Albedo of Neutrons (DAN) instrument, designed for working through the prime mission, is returning data showing reduced voltage. Even if DAN could no longer generate neutrons, the instrument could continue to check for water molecules in the ground by using its passive mode. The performance of the wind-sensing capability from Curiosity's Rover Environmental Monitoring Station (REMS) is also changing, though that instrument still returns other Mars-weather data daily, such as temperatures, humidity and pressure. Analysis is in progress for fuller diagnosis of unusual data from DAN, which was provided by Russia, and REMS, provided by Spain. Gather, cut up and grind up iron-nickel meteorites. Sift if necessary, then use the powder to 3D print what is essentially a steel part. The iron-nickel composition should have a fairly low coefficient of thermal expansion and the material will only weigh 38% of what it would on Earth. Don't worry, the surface of Mars has plenty of such meteorites, in part due to its closer proximity to the asteroid belt. By the way, this has already been done here on Earth. Considering how much has been found by rovers, odds are humans will be able find plenty to get us started. To answer exactly how much and where these meteorites are requires further exploration. Another factor to keep in mind is everything weighs less on Mars, so "Martian Steel" works even better holding things up. Hey, I just made that name up. If you really want a huge supply, consider visiting 16 Psyche in the asteroid belt. NASA is wisely considering a mission there. Suggested response for AAP: "Genius idea Mark, I wish I had thought of it." Mark: It wouldn't be the first time people used meteorites as tools. The first iron tools may have been made from meteorites. King Tut even had a meteorite iron-nickel dagger. Well, the amount of material you need for any kind of industrial purposes (read building stuff) is a tiiiiny bit larger than the occasional rock lying around on the surface. Most importantly, we would have a source of "steel" on Mars when we needed it most, i.e., at the beginning. This should justify the cost of bringing a 3D printer capable of printing metal parts early on in our exploration/colonization of Mars. You seem to be looking for the weak link here, so I will give you one. The throughput of 3D printers is still too low for many applications. If we need a planet's worth of I-beams, it would probably take an impractical number of today's 3D printers or time. But improvements in the future may change that picture. Regarding the meteorites themselves, all three U.S. rovers found iron-nickel meteorites at widely spaced locations on Mars. There's hardly any oxygen in the Martian air and no meteorite scavengers we know of, so there is probably a good abundance of them. Thus, it stands to reason there is an ample supply for low volume applications, like building/repairing bases, making spare parts and inventing tools we didn't foresee/bring. They're headed toward a place called hematite ridge. Plenty of iron there I bet. Mars is red because of all the iron compounds lying about. You know? "NASA has discovered that hematite is one of the most abundant minerals in the rocks and soils on the surface of Mars." Red planet...get it? get it? You folks should read (or review) Zubrin's Case for Mars. He has a clever section on making steel from hematite and/or other ores to colonize Mars. I don't disagree with any of that or your comments, however, making steel from oxidized ore is often energy intensive or requires chemicals produced in a separate process. On the other hand, we could start 3D printing steel parts from meteorites within days of our first arrival, whose benefit would far outweigh the costs of bringing the necessary equipment. The first 3D printer in space has already deployed to the space station. Don't be surprised to see this idea getting used on Mars. If you consider the dollar value to put a pound of anything on Mars, those meteorites are worth orders of magnitude more than gold. You heard it here first, although someone certainly may have beat me to it. Instead of resisting the idea of 3D printing with martian meteorites, how about embracing it to consider the possibilities? I think you will find the FLEXIBILITY it offers opens up a host of possibilities, any one of which might make the idea viable on its own. For example . . something important unexpectedly breaks. The astronauts struggle to fix it. Engineering teams at NASA and around the world conceive of and upload the solution to the 3D metal printer while they are sleeping. The astronauts wake up to find their problem is solved and only needs a little finishing and polishing prior to installation. NASA adds a little printed message to the part, "This should do the trick. - Love, NASA and your many friends on Earth." Hearts are warmed, morale rises and the chances of a successful mission increase. Roaming around mars for 1000s of miles collecting rocks and pebbles is also energy intensive. Considering also that most of them would be buried. how about embracing it to consider the possibilities? How about embracing it to consider the possibilities that people whose job it is to assess availability of resources on mars, haven't already considered the possibility of using iron-nickel meteorites? How about typing iron and meteor and resources and Mars into Google and finding out what people already know? I usually do this whenever I think I've got a bright idea. And reading your posts in a little more depth, 3D printing for space is already happening on the ISS. -What makes you think this isn't for use on mars and elsewhere? "'grinding' or melting is no easy task." Seriously? Dude, we could use multiple grinding wheels each covered with engagement ring quality diamonds and still save billions of dollars by not having to carry all the metal mass to Mars. Give me a break! The comments here may be a result of the fact that it has been far too long since we left LEO in 1972. Instead of thinking about traveling to Mars as a real possibility, with real engineering problems to be solved, all the comments merely attack what is obviously a very promising approach. Dr. Zubin (not me) came up with the phrase, "live off the land," to describe a pragmatic approach to exploring/colonizing Mars. It means to use the resources found there instead of trying to bring everything with you. I conceived of and proposed an innovation described here to do exactly that to help make our Mars program a little more practical. Anyone else noticed that the ChemCam "image" is actually just a blowup of the MastCam image of the rock on the ground? It is even in the same orientation. For the shadow you can see that the pictures were taken at different moments. Which shadow are you referring to? Even comparing the light reflections gives the exact same image.